Let's roll up our sleeves and get to work! This is natural canvas tote bag is Union-made in the USA. 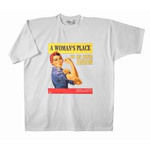 This Rosie The Riveter t-shirt celebrate the hard-working women of past and present with your own personalized quote. Both men and women will love the generous cut of these heavyweight, pre-shrunk, 100% cotton, USA made shirts. 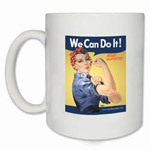 This vibrant bumper sticker features the popular saying "We Can Do It!". 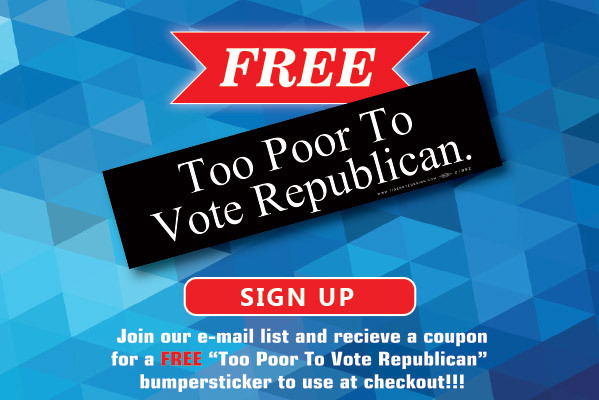 This bumper sticker measures 11.5" x 3". Union made in the USA. Geraldine Doyle, the original Rosie the Riveter. 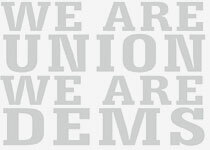 Honor an American Icon with this 3" union-made button. 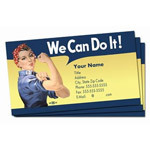 This mouse pad features Rosie the Riveter can be personalized with a quote of your choosing. 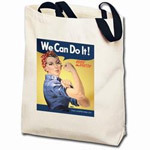 Check out this tote bag which features Rosie the Riveter that can be personalized with your own quote. This tote bag measures 16.5" x 15" and opens up with a 4" bottom gusset. 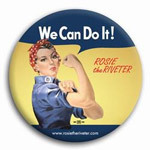 A Rosie the Riveter button featuring the saying "We Can Do It!". This celluloid button measures 2.25" and features a safety pin back. Union made in the USA. A Rosie the Riveter button featuring the saying "A woman's place is in her union". This celluloid button measures 3" and features a safety pin back. Union made in the USA. A Rosie the Riveter button featuring the saying "A woman's place is in her union". This celluloid button measures 2" x 2" and features a safety pin back. Union made in the USA. A Rosie the Riveter button featuring the saying "A woman's place is in her union". This celluloid button measures 2.25" and features a safety pin back. Union made in the USA. This Rosie The Riveter t-shirt celebrate the hard-working women of past and present. Both men and women will love the generous cut of these heavyweight, pre-shrunk, 100% cotton, USA made shirts. 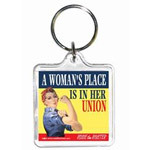 This mouse pad features Rosie the Riveter with the quote "A Woman's Place is in her Union!" Check out this tote bag which features Rosie the Riveter and her iconic saying "A Woman's Place is in her Union." This tote bag measures 16.5" x 15" and opens up with a 4" bottom gusset. A Rosie the Riveter lapel pin featuring the saying "A woman's place is in her union". This lapel pin measures 1" x 1" and is union made in the USA.